After being dipped in a bucket of bleach and getting a ripping treatment, my Levi's 501 made their third transformation. 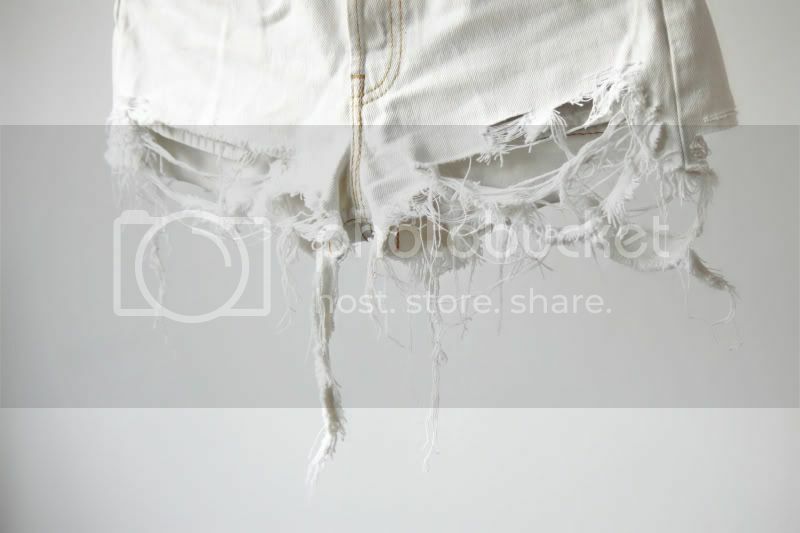 From full lenth jeans into shorts into this white, trashy, destroyed piece. It'll only become more beautiful after a couple of washes which will make the strings, rips and tears look a bit more natural. I used the same technique to destroy the denim as in this post. haha I love how you experiment with your clothes! Very inspiring. I was thinking about bleaching my denim jacket, but I wasn't sure how white I can get it. How dark where your Levi's before bleaching? So nice! 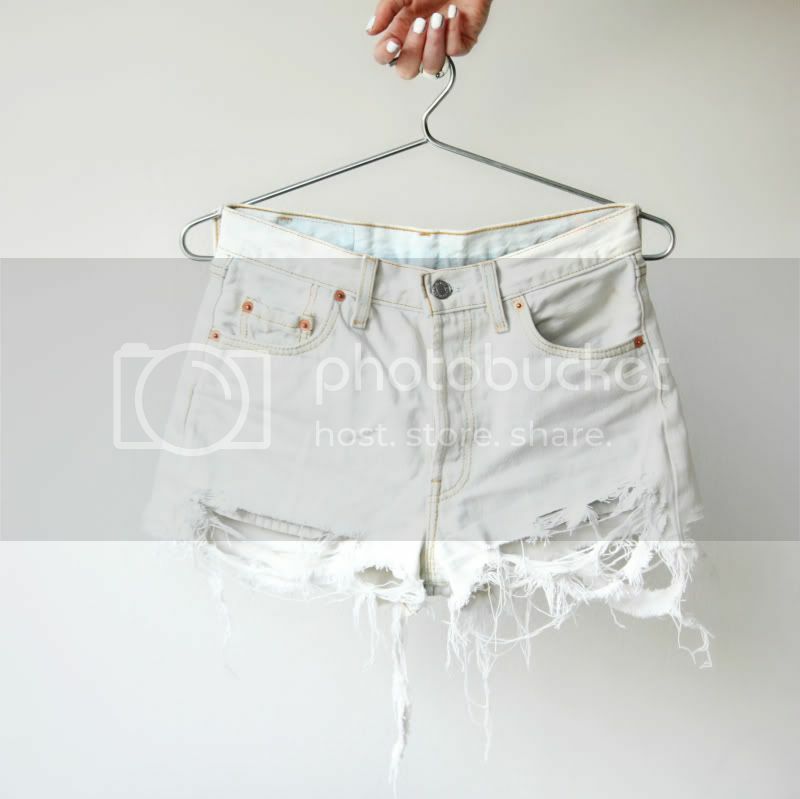 I'm wearing an old pair of jeans shorts just now and thinking maybe I should bleach them... They are also a bit loose now - lost some weight - and wondering how I can shrink them! wow they really look very very nice!! Waouh, good job ! Just need to fumble into my wardrobe to find an old jeans ! Thanks for sharing ! Bleaching denim is so fun. I've been bleaching tons of denim lately too; such a perfect summer trend updo! No trash but a treasure! ;) Looks great. Shut up, that is perfect. It looks like it was bought that way. Those came out amazingly well. it looks really good. I need to do that!!! Great project! I need to have those shorts! Wow, good job! They look great! did you pick some people to give those perspex earrings to yet????? Wow wat gaaf! Kan niet wachten om m aan te zien! This is amazing! Love the trashed look! Oh, they look good now! What did you use for bleaching? It turned out very cool, it's a perfect summer piece! They look great! I've been wanting to do something similar to my old and tired denim lately. a FabuLouS ocean of lust-worthy outfits! je kent me niet, maar ik zag dat ze op onderstaande site een foto van je gebruiken zonder te melden waar die vandaan komt. Erg onbeschoft als je het mij vraagt. Nja kijk maar of je er iets mee doet. I LOVE YOUR BLOG? How old are you? Dit is echt een gaaf broekje, die wil ik ooook!